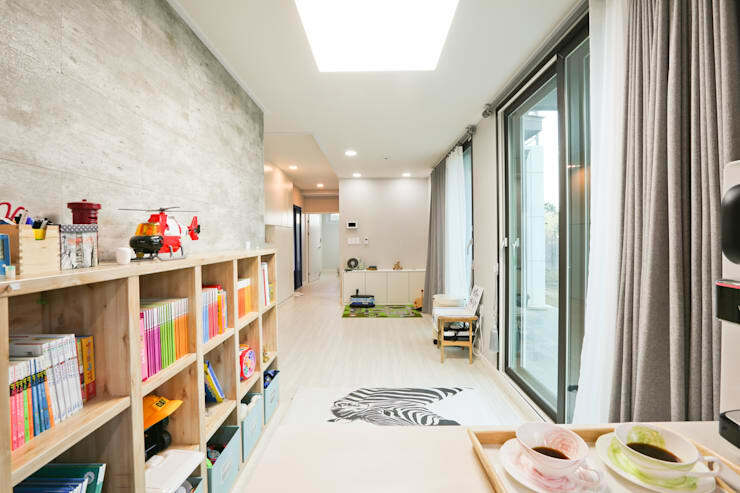 Hangul House have done it again, creating a beautiful and modern family home that is the envy of just about anyone. With cozy nooks, functional crannies and trendy finishes, this a home that all of us can learn a thing or two from. Today, at homify, we are going to learn how to create this look and feel in our very own homes. With an expert's touch here and there, we can truly recreate a special family home that looks like it comes out of the pages of a design magazine. From the get-go, we can see that this is no ordinary home with a white picket fence. 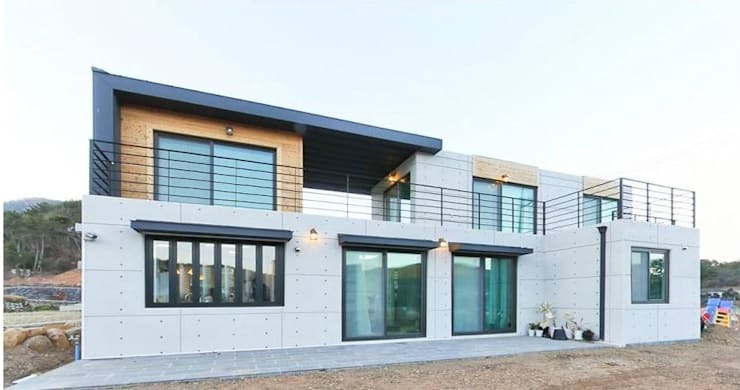 The designers have gone for a variety of materials and colours—wood, black metal, grey clad and glass, which gives the outside of this home a very industrial chic look and feel. The bottom of the home is designed in an L-shape, while two blocks rest on the upper level, with a wide gap between them. This gap features a roof, which extends over the first block on the left. It serves as a balcony or terrace area. If move inside the home, we can see that the designers have used the space to their absolute advantage. Even though it is quite a narrow home, they've managed to create spacious rooms that are as interesting as they are functional. This is a kid's bedroom, but the basis of the room is very neutral, meaning it could be used for just about anything. The light wooden floors work with the beautiful, big glass windows and doors. The walls feature a grey wooden facade. This is a fantastic tip as it means that when your kids grow up, you don't have to spend a fortune on redoing the walls, floors, curtains or windows. You simply have to swap some of the furniture, cushions and accessories out. The accessories used in this space are perfect for a kid's bedroom—a zebra rug, colourful books and toys placed strategically throughout the room. Invest in smart storage solutions when it comes to your kid's bedroom so it isn't littered with toys and accessories. Also check out these fantastic bedroom ideas that your child would love. As we've mentioned before, the designers have utilised every square cm of this home, including this cozy little corner. 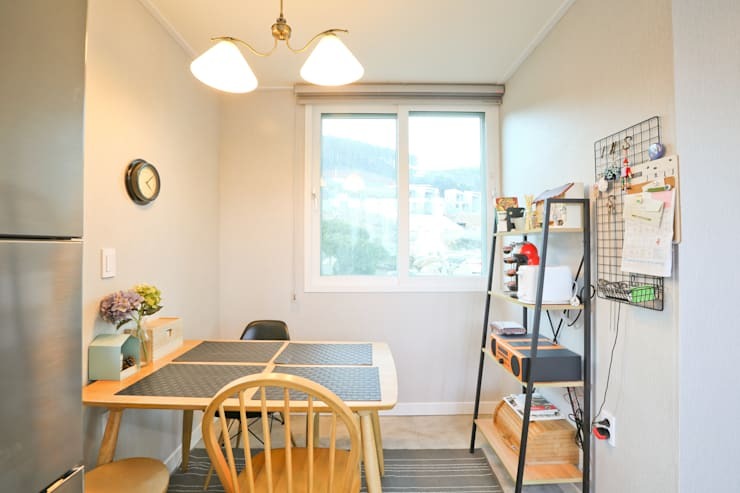 They've placed a small, square and yet modern dining room table that seats four into this space as well as a little shelf with accessories. Notice that there is still enough space to walk around! The designers have used simple accessories to brighten this space as well—a wall clock, a little vase of flowers and a trendy overhead lamp. These small touches make the biggest of differences. Have a look through these: Dazzling lighting ideas for modern homes. The bathroom is a place in the home that is not to be overlooked! And this one certainly hasn't been, with it's modern finishes and relaxing, tranquil look and feel. The light wooden ceilings work with the sandy-coloured tiles and the beige walls to create a warm and earthy cocoon from the rest of the world. The only danger is you may never want to leave a bathroom like this! 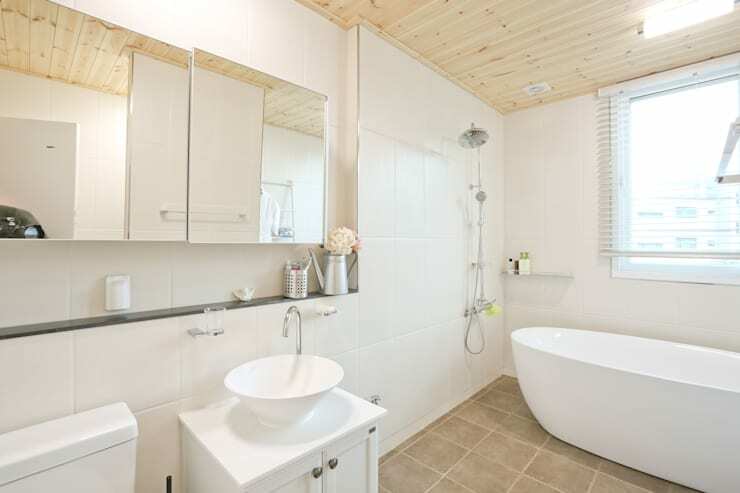 The tub and the basin are very vogue and inviting, taking bathroom style to the next level. Remember that a modern tub or basin can change the whole look and feel of your bathroom! The designers have included cupboards under the sink as well as cupboards behind the mirror, which means that all personal items can be stored out of sight. This is a great tip, as it leaves the bathroom looking neat and minimalist. When it comes to working from home, you want to be inspired, feel focused and get creative. 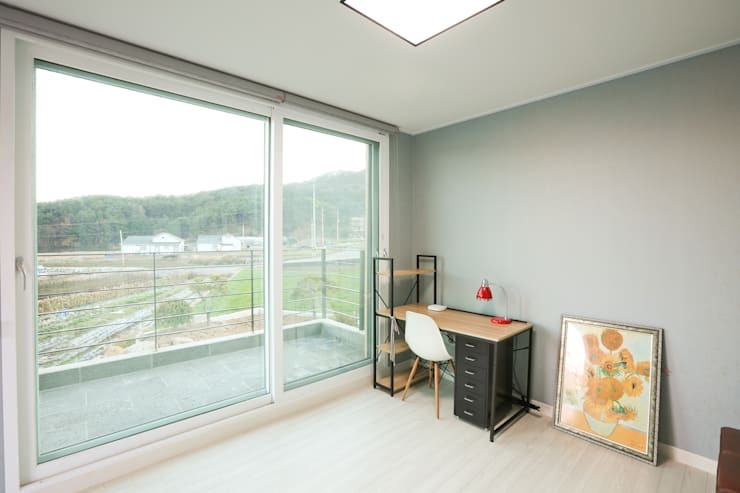 This is why it's so important to have a neat and organised office space, where you may also have expansive views of the surrounds like in this design. While the desk isn't facing the window, there is lots of natural light filtering into this space. This already creates energy and fresh beauty and light in this space. The desk is very simple, without much clutter. You don't want distractions while you are working away. Minimalist is the way to go! The walls are a grey colour, which is very calming—fantastic for this type of space. Looking for something a bit more interesting? Read this ideabook on: Bringing blank walls to life. 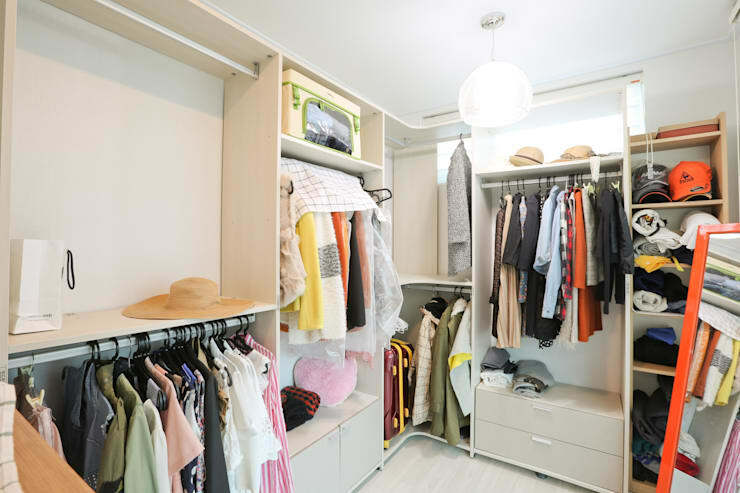 The walk-in closet is a must for any family home, especially if you're a fan of fashion! Opt for very neutral colours in this space, including white walls and beige cupboards and drawers. As you can see in this image, your clothes, hats and scarves bring enough colour to the space. If you want a bit of a neater walk-in closet, include cupboard doors so that your items are hidden away. Remember to feature a functional, bright light so that you can see what you're choosing to wear for the day. What do you think of walk-in closets?